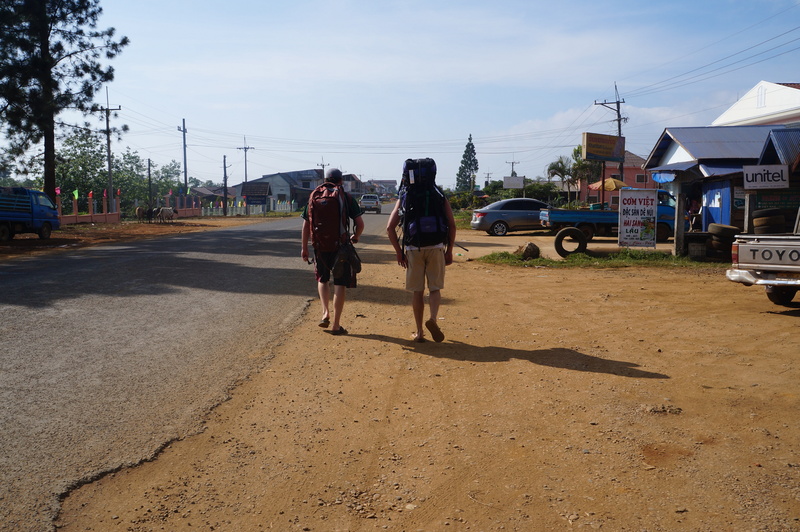 We rolled into Pakse, Laos, just before Christmas – deep in the year 2013. Pakse is a quiet town with not much of a nightlife, but we had decided to shell out a bit and stay someplace reallll niiiice for the holiday. So we decided to book a resort right on top of a waterfall, halfway down the Pakse-Paksong road, which is 50 km long. Heading out of town on our way to the resort, we were hurtin’, but all excitement. We took a tuk-tuk built for 8-10 people. 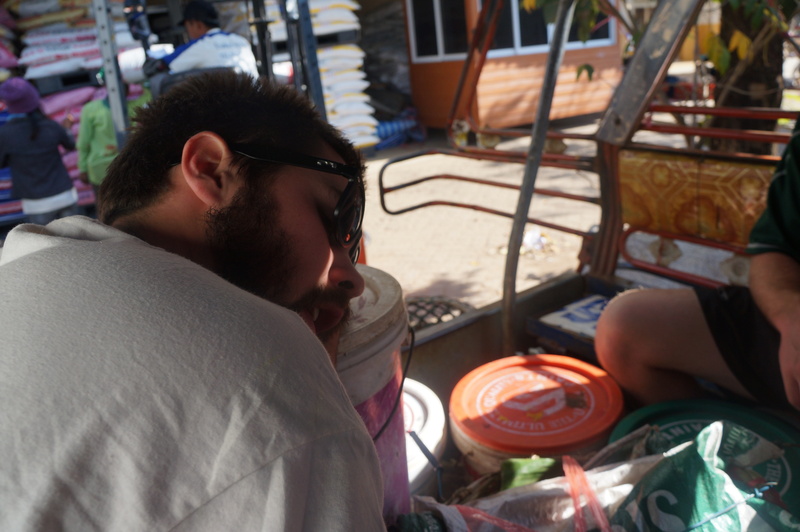 ‘Twas stuffed to maximum capacity: 14 locals with their groceries (12 sacks of rice, three live chickens, and five big baskets of fish) shared our trip. There were stops along the road for drop-offs and pick-ups, but we made the trip in about 2 hours. 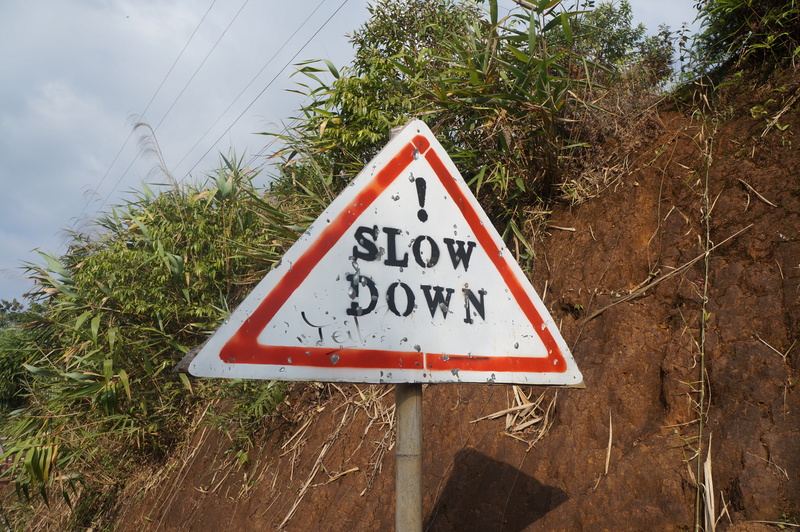 Now, contrary to popular belief, the primary language in Paksong is not English. 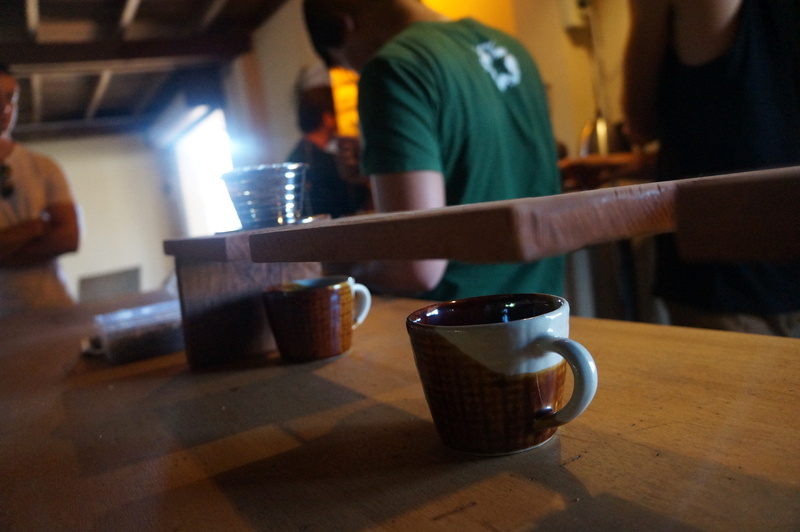 We had a bit of trouble navigating our way back out of Paksong, but with a little help from a Seattle-born coffee-aficionado, we were able to find out just where we were going. 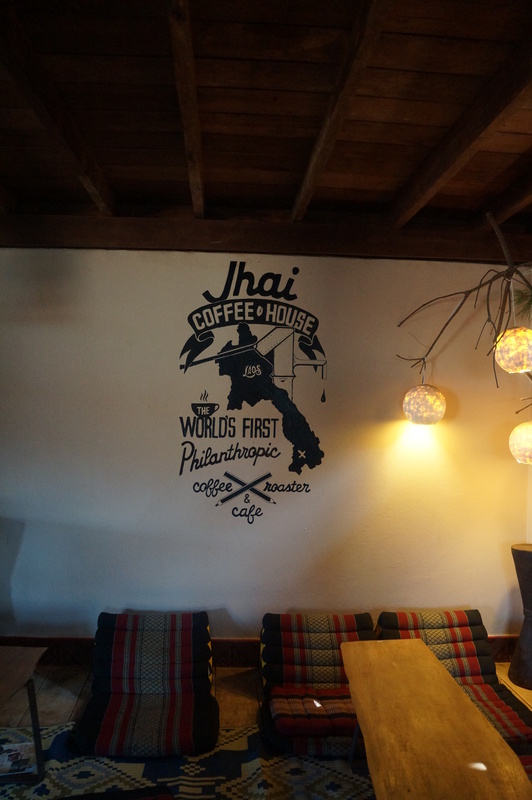 We stopped at Jhai Coffee House and had ourselves some amazing home-brewed Laotian coffee. 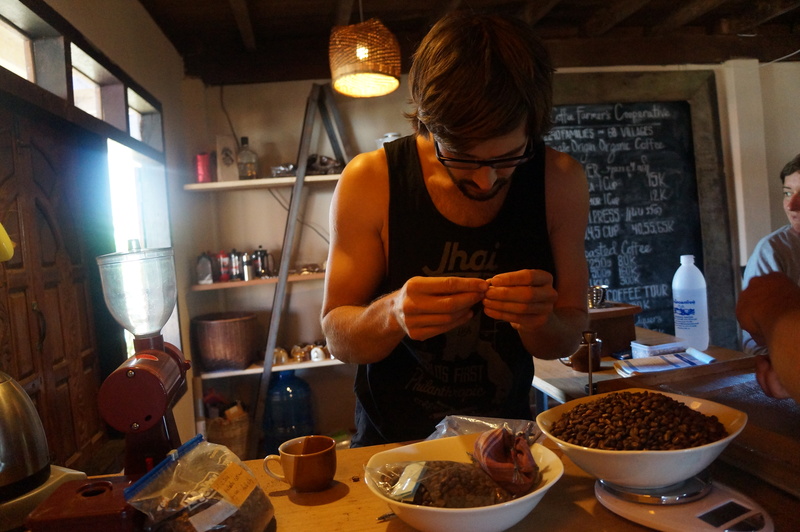 Though we didn’t do a tour, which is popular in Paksong, we saw some of the steps that go into making this amazing coffee. The owner, Tyson, and his partner, Jackie, were pros. I never knew that coffee making was indeed so complex. The coffee house is an NPO, and all the money they make goes into building clean water wells at nearby schools, a pretty amazing organization. We were glad to shell out a few extra bucks to support the cause. Plus, the coconut curry was some of the best ever. Thank you, Janelle. 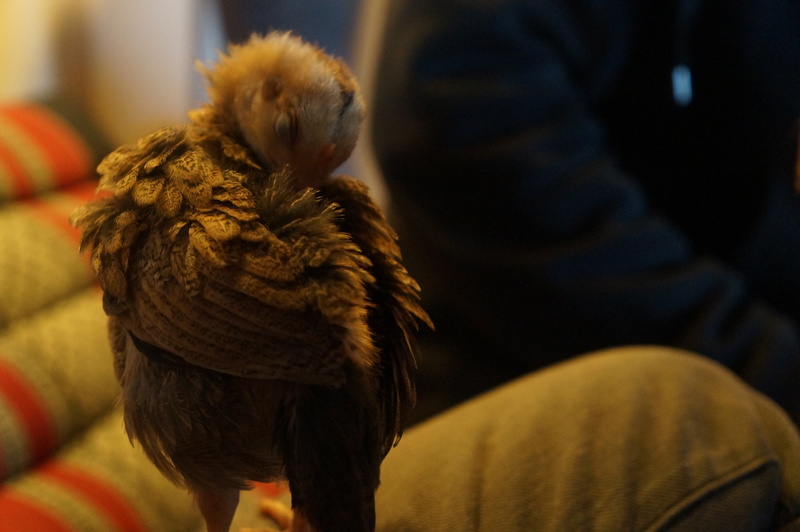 The owners had adopted a cat, a chick, and a puppy, making our time there even more cuddly and delucius Malfoy. LOL WHAT DOES THAT MEAN!? Tyson constantly said, “Hey Jackie…”, whenever he was addressing (commanding) Jackie. It really wasn’t that funny but it’s become one of our favorite quotes to drop during our trip. We really say it too often, and quite frankly, it’s usually not appropriate. 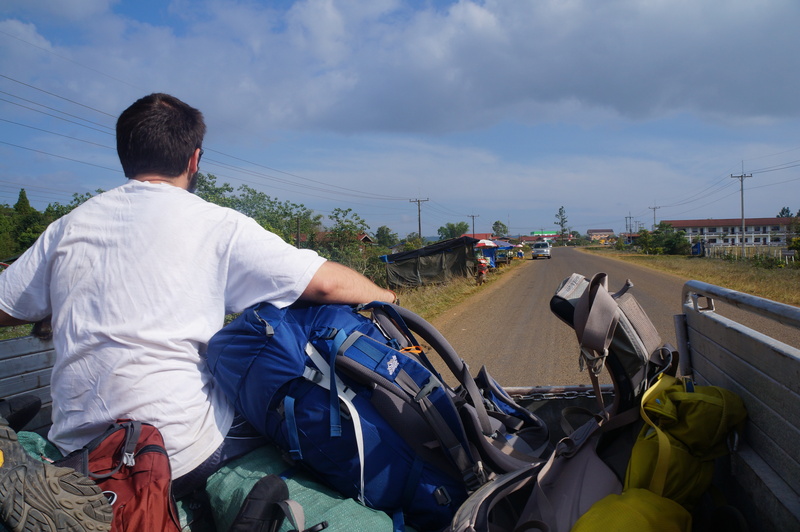 Ban E Tu Waterfall Resort was 15 km outside of Paksong, but with our heavy packs we figured we probably wouldn’t be making good time, so we opted for our first hitchhiking experience! It was great. 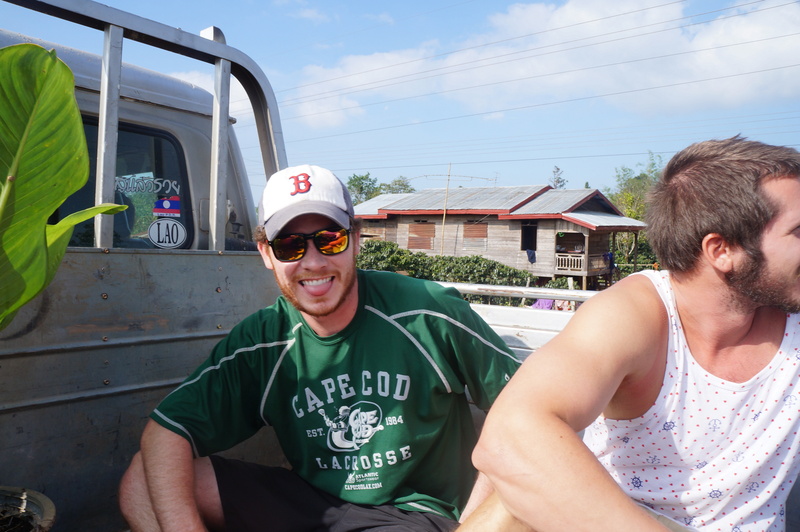 Who woulda thunk that the truck bed of an old Ford pick up would be our salvation? After hailing approximately ten trucks unsuccessfully, one kind lady finally obliged. We made it to our destination quickly from there and realized that we would be celebrating all by our lonesome. 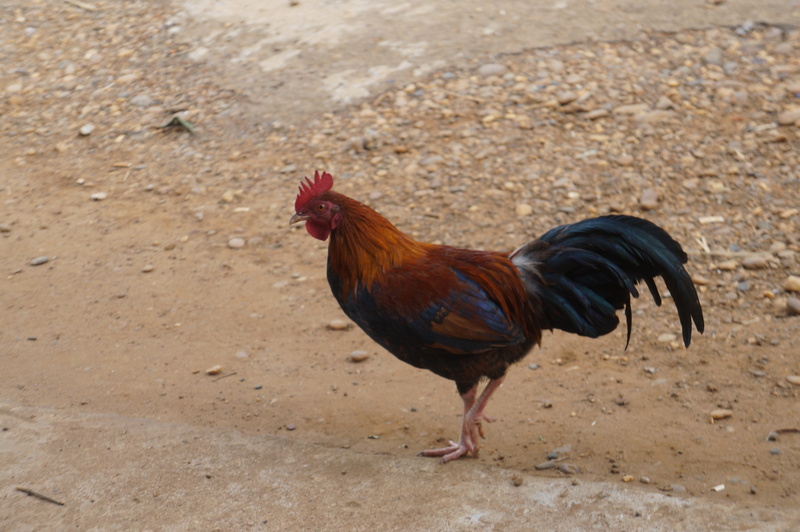 Roosters are just as common to see as trees…. Though not well-kept, the resort was very nice. 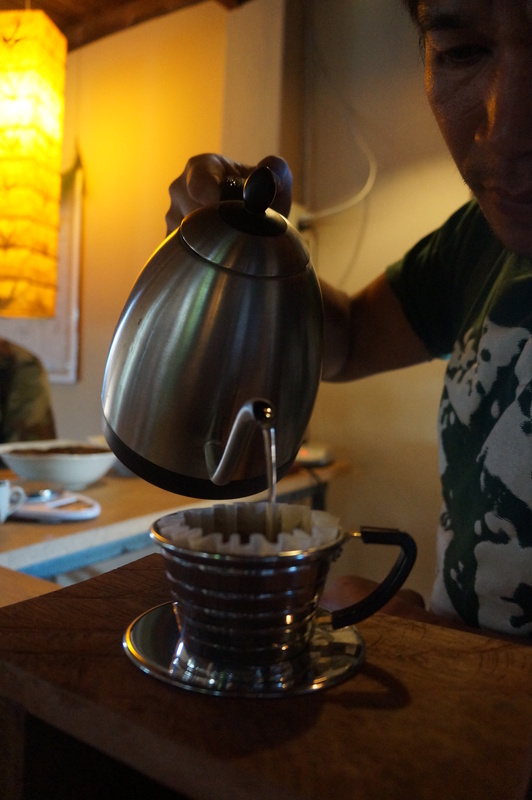 We had two separate bungalows that overlooked some extensive coffee bean gardens and were perched on top of a steep hill. 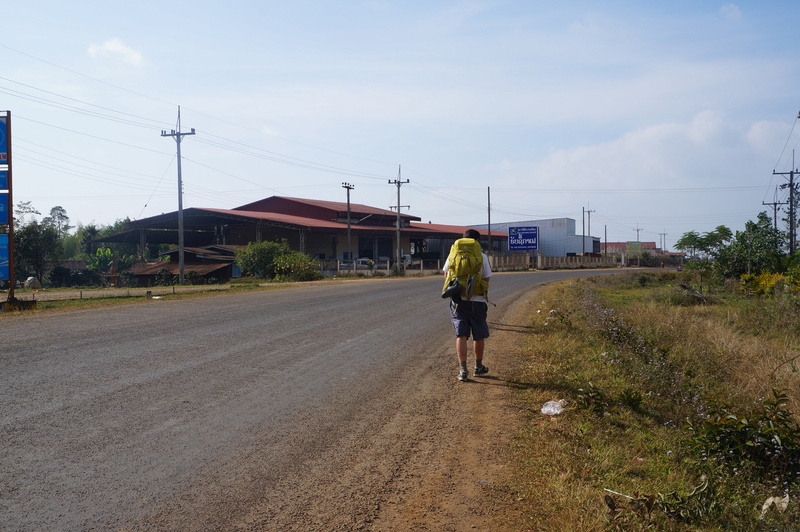 We were in good company for the holiday, ourselves, but things were not the same out in “the boonies” of Laos, so we hitched our way back to Pakse the next morning. 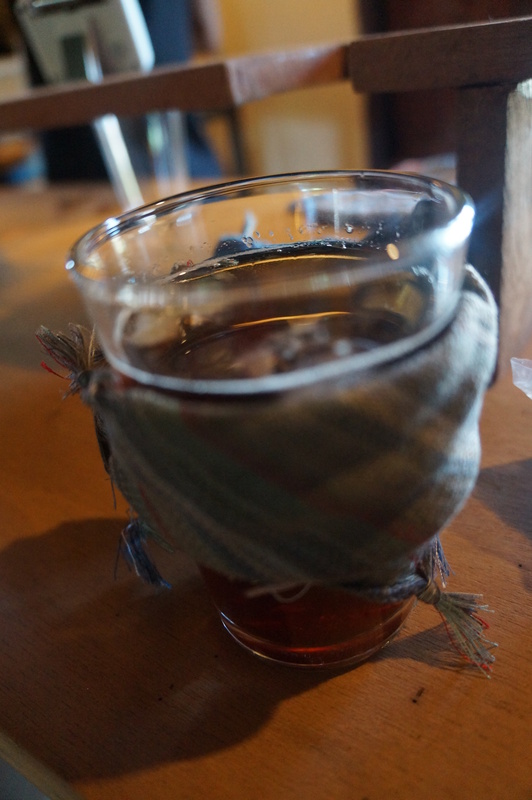 Our full trip around the Bolaven Plateau deserves a single post. This one is just the teaser. Tease tease.